For the Gerbi new building project in Willisau, Elektro Illi AG and R&M together implemented an FTTH complete solution. R&M’s service made a significant contribution to the success of the installation. We were able to achieve optimum implementation of Swisscom’s FiberSpot concept. Customer: EG Gerbi and other companies from Willisau, Switzerland. Installation partner: Elektro Illi AG, Willisau, Switzerland. Project: Sustainable Gerbi building complex in Willisau with four apartment blocks, 2015. Application: Fiber to the Home (FTTH), Swisscom FiberSpot concept, R&M Home Wiring System with star cabling. 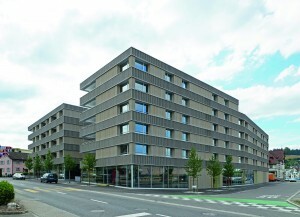 In the Willisau Center (Lucerne canton, Switzerland), investors wanted to implement an exemplary, modern residential project: the Gerbi new building project. The intention was for the four blocks housing 60 apartments to be sustainable and future-proof. The communications infrastructure also had to be designed for long-term use, so as to enable the provision of broadband services and multimedia applications in every apartment. As a result, the planners sought a fiber optic solution (Fiber to the Home, FTTH) for the complex and structured cabling in the buildings. However, splicing fiber optic cables took the installation partner into uncharted waters. The building owners decided on a complete solution from a single source and were looking for an experienced partner. R&M were therefore able to offer the proven FTTH and Home Wiring Systems and to implement the project together with Elektro Illi AG. Based on a Swisscom FiberSpot node, the whole complex was connected using fiber optic cabling. 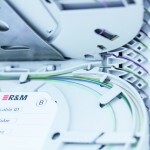 R&M’s Building Entry Points (BEPs), Optical Distribution Frames (ODFs) and Single Circuit Management (SCM) system serve to distribute the fibers into the building and floors. Optical Telecommunication Outlets (OTOs) were used in every apartment for the transition of the fiber optic connections to home cabling in a star configuration. Importance was attached to every detail. The connections at the BEPs were therefore given a unique coding using a clip. This makes later patching easier. In the context of the project, R&M trained Elektro Illi AG’s experts on site in the professional implementation of a fiber optic installation. Quality assurance, acceptance and certification of the cabling system were also part of the bundle of services provided. This meant that perfection from A to Z was assured. 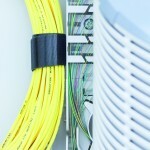 “Our installers had had little previous experience of splicing FTTH solutions. However, we now have this expertise and will be able to use it more and more in the future,” summarized Patrick Hodel, Head of Telematics at Elektro Illi AG. He felt his staff really valued the practical and technical support provided by R&M and that R&M had offered a top service, from consulting services to training on site. “The products are top-quality and easy to handle. Choose R&M and everything works,” confirmed head service technician Lukas Christen.